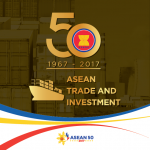 As the commemoration of the Association of South East Asian Nations’ (ASEAN) golden jubilee is underway, the ASEAN Statistics Division (ASEANstats) of the ASEAN Secretariat joined in the celebration by launching three publications. 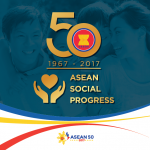 These are Celebrating ASEAN: 50 Years of Evolution and Progress, the ASEAN Statistical Report on Millennium Development Goals 2015 and the ASEAN Community Progress Monitoring System (ACPMS) 2017. How has the ASEAN progressed economically and socially since its establishment in 1967? 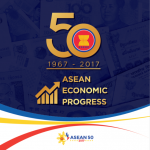 Celebrating ASEAN: 50 Years of Evolution and Progress presents an overview of ASEAN evolution and progress since its founding through a selection of key socio-economic indicators. 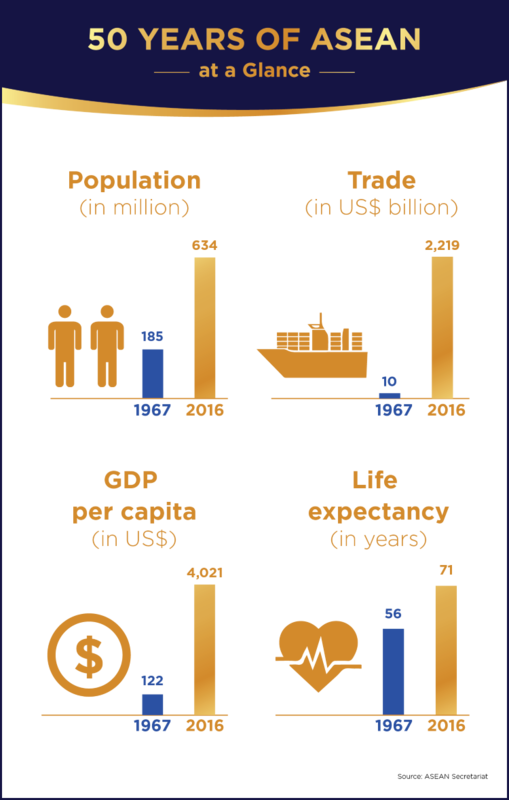 The publication is organised into four key themes, namely economic progress, social progress, economic connectivity, and narrowing development gap. This publication is supported by the European Union Delegation through the EU-ASEAN COMPASS Project. To what extent have the ASEAN Members States achieved the targets of Millennium Development Goals (MDGs)? The ASEAN Statistical Report on Millennium Development Goals 2017 examines the progress and achievements of the ASEAN Member States with regards to the MDGs. The report provides estimates for the 25 MDG indicators every five years from 1990 to 2015, and compares the final change from 1990 to 2015 with the MDG targets. This publication is also supported by the European Union Delegation through the EU-ASEAN COMPASS Project. Where do the ASEAN Member States stand in various economic and socio-cultural indicators pertinent to the ASEAN Community Vision 2025? Finally, the ASEAN Community Progress Monitoring System (ACPMS) 2017 Report is the third of the ACPMS report series which provides statistics on key integration outcomes in ASEAN. In this third report, the selection of indicators is aligned with the envisaged characteristics of the ASEAN Economic Community (AEC) Blueprint 2025 and the ASEAN Socio- Cultural Community (ASCC) Blueprint 2025. 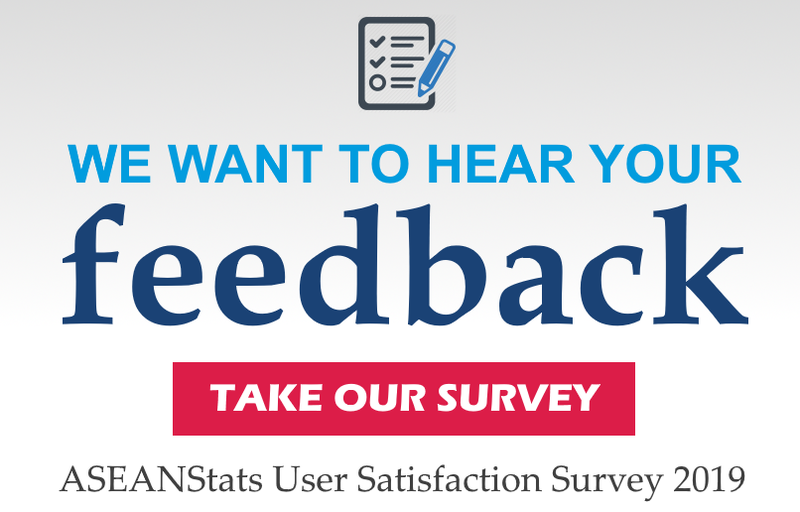 The report contributes to and complements ASEAN’s broader integration monitoring framework. The ACPMS Report 2017 is Supported by the Australian Government through the ASEAN-Australia Development Cooperation Program Phase II. 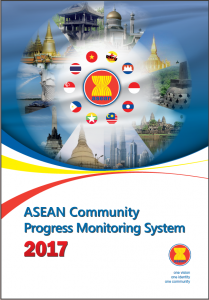 This 2017 ASEAN Community Progress Monitoring System (ACPMS) Report is the third of the APCMS report series. The ACPMS report series provide statistics on integration outcomes in ASEAN pertaining to envisaged characteristics of the ASEAN Economic Community (AEC) and ASEAN Socio-Cultural Community (ASCC), including indicators on global development aspirations. This 2017 ACPMS Report examines 30 core indicators, describing five characteristics envisioned for the ASEAN Community Economic Blue Print 2025, and five characteristics of ASEAN Socio-Cultural Community Blueprint 2025. This ASEAN Statistical Report on Millennium Development Goals 2017 is our final attempt to compile the 25 MDGs Indicators commonly available in the ASEAN Member States. 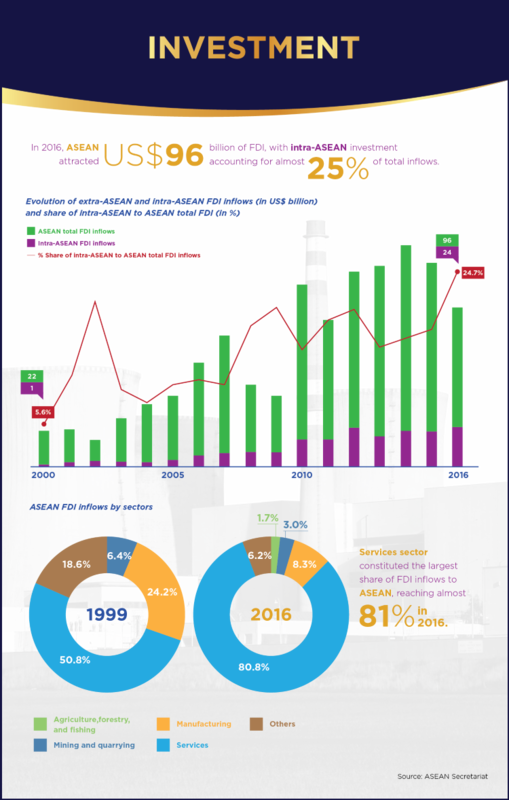 It features the MDGs indicators of ASEAN aggregates in absolute numbers as well as information on narrowing development gaps. These two main attributes differentiate this Report on the ASEAN MDGs from other published MDGs reports. 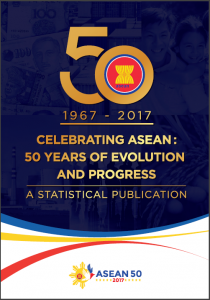 “Celebrating ASEAN: 50 years of evolution and progres” is a statistical publication released on the occasion of the 50th anniversary of the signing of the Declaration establishing the Association of Southeast Asian Nations (ASEAN). Since its foundation in 1967, ASEAN has made extraordinary progress in preserving peace and security, promoting economic co-operation and integration as well as social development. 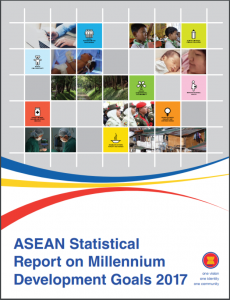 This publication presents a collection of statistical indicators from ASEANstats’ databases, and highlights the main findings observed to showcase the evolution and progress of ASEAN over the past decades. 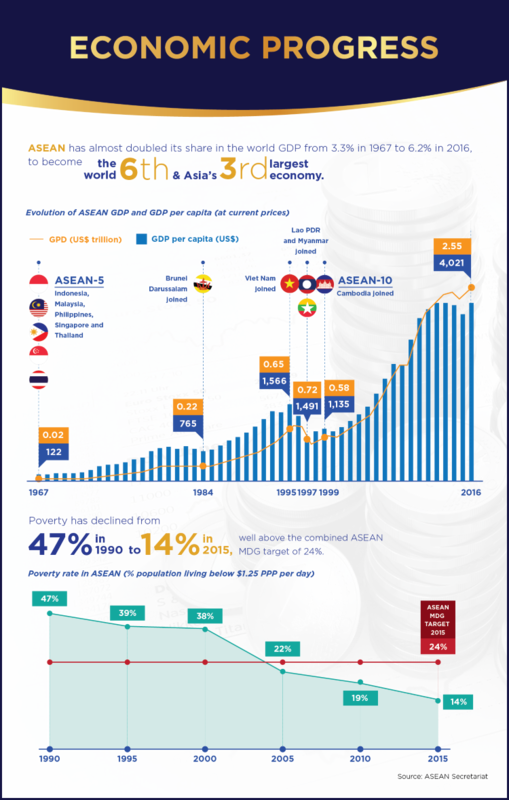 ASEAN Economic Progress contains infographic on ASEAN evolution and progress in GDP and poverty. 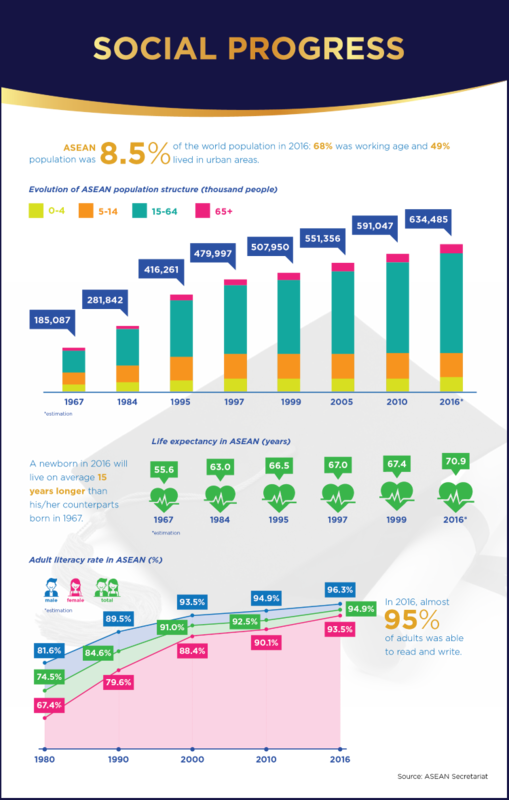 ASEAN Social Progress depicts infographic on ASEAN progress in key social indicators. 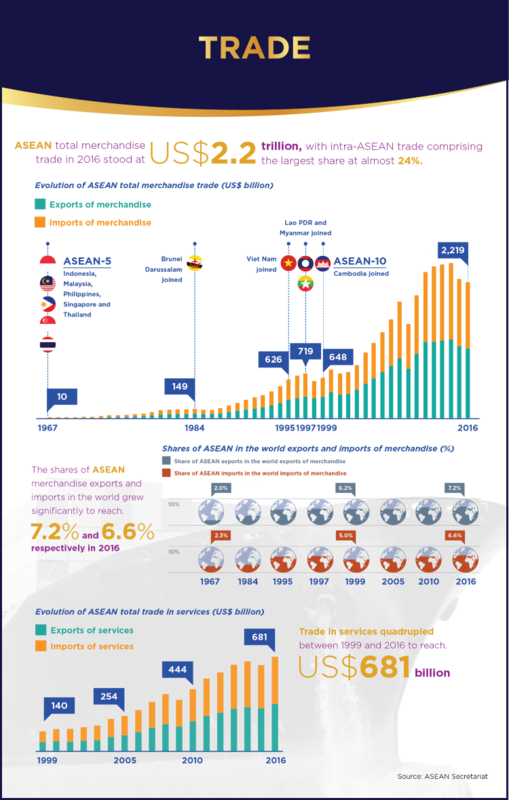 ASEAN Trade and Investment provides infographic on ASEAN progress in trade and investment.